Happiness is your birthright - and it is readily available at any given moment, teaches Pema Chodron. So why di we live in such suffering? 'The potential for happiness is not based on outer things - they come and go, causing us misery', she begins. 'We're always chasing after something, trying to avoid the difficult places. But there are a lot of small sweetnesses that we ignore because they're so fleeting.' 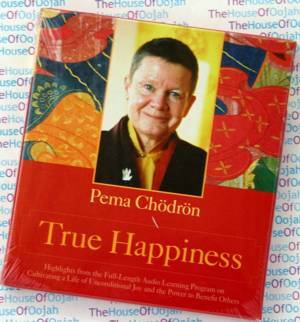 On True Happiness, Pema Chodron guides us through simple yet effective practices that show us how to recognise and nurture these moments of delight, cultivating them until they become more and more frequent, accessible, and real. Recorded at Gampo Abbey Monastery in Nova Scotia, True Happiness features highlights from the full-length audio learning course of the same title, and gives you the opportunity to absorb the teachings of Pema Chodron at your own pace. Join this best-selling author and beloved teacher for classical meditations and practices to dissolve the barriers to your heart, reconnect with your basic goodness, and cultivate a sense of happiness - by learning to enter natural 'windows' of spaciousness that open us to freedom. Pema Chödrön (formerly Deirdre Blomfield-Brown, born 1936) is a fully ordained Buddhist nun in the Tibetan vajrayana tradition, and a teacher in the lineage of Chögyam Trungpa. The goal of her work is the ability to apply Buddhist teachings in everyday life. She is one of the most successful interpreters of Tibetan Buddhism for westerners, noted for her approachable and down-to-earth teaching style. Pema Chödrön has conducted workshops, seminars, and meditation retreats in Europe, Australia, and throughout North America. She is resident teacher of Gampo Abbey, a monastery in rural Cape Breton, Nova Scotia, Canada. Pema Chödrön was born in New York City and graduated from the University of California at Berkeley. She previously worked as an elementary school teacher before converting to Buddhism. Chödrön began to study with Lama Chime Rinpoche in the French Alps, and became a Buddhist nun in 1974 while studying with him in London. She first met Chögyam Trungpa Rinpoche in 1972, and at the urging of Lama Chime Rinpoche, she took him as her root guru. She studied with him continuously from 1974 until his death in 1987. In 1984, Chödrön moved to Gampo Abbey, and became its director. There, she published her first two books to widespread critical acclaim. In late 2005, Pema Chödrön published No Time to Lose, a commentary on Shantideva's Bodhisattva's Way of Life. Pema has two children and three grandchildren.